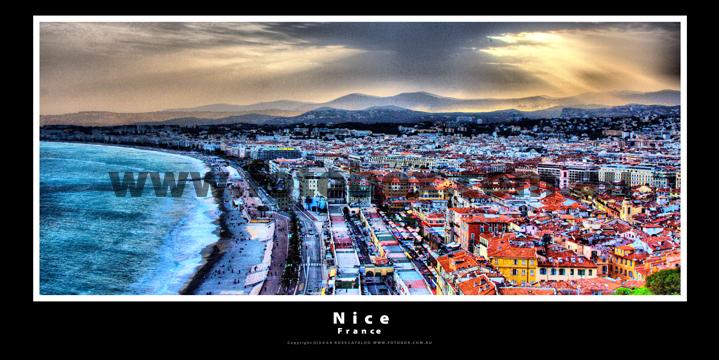 Image Information " Nice is a city in southern France located on the Mediterranean coast, between Marseille, France, and Genoa, Italy, with 347 060 inhabitants in the 2006 estimate. The city is a major tourist centre and a leading resort on the French Riviera (Côte d'Azur). It is the historical capital city of the County of Nice (Comté de Nice).The Promenade des Anglais ("Promenade of the English") is a celebrated promenade along the Baie des Anges, a bay of the Mediterranean, in Nice. Before Nice was urbanized, the coastline at Nice was just bordered by a deserted stretch of beach covered with large pebbles. The first houses were located on higher ground well away from the sea. The city of Nice, intrigued by the prospect of a pleasant promenade, greatly increased the scope of the work. The Promenade was first called the Camin dei Anglès (the English Way) by the Niçois in their native dialect Nissart. After the annexation of Nice by France in 1860 it was rechristened La Promenade des Anglais, replacing the former Nissart name with its French translation. The Hotel Negresco on the Promenade des Anglais was named for Henri Negresco (1868-1920) who had the palatial hotel constructed in 1912. In keeping with the conventions of the time, when the Negresco first opened in 1913 its front opened on the side opposite the Mediterranean. Another place worth mentioning is the small street parallel to the Promenade des Anglais, leading from Nice's downtown, beginning at Place Masséna, and running parallel to the promenade in the direction of the airport for a short distance of about 4 blocks. This section of the city is referred to as the "Zone Pietonne", or "Pedestrian Zone". The banning of cars creates a more serene setting. Here tourists can find a fine selection of restaurants, specializing in both Niçoise cuisine and various types of foreign cuisine. There is also a large selection of cafés where one can sit and enjoy an espresso or choose from a variety of speciality coffees, gelati and desserts, and watch the city walk by. There are also plenty of small shops selling clothing, shoes and souvenirs."